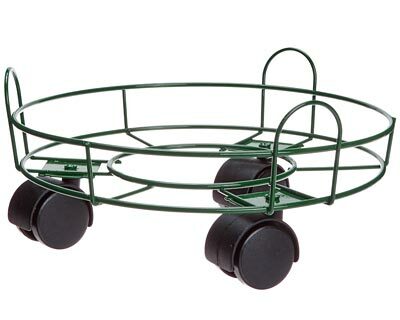 Help protect your potted plants from frost and cold floors by elevating them on these Gardman Green Plant Caddies. Placing your plant on a caddy allows air to circulate all around the item, and can also help reduce staining on your floor or patio. These four durable units each have a dual top metal band, with three small arches above the top ring for strength and style. These arches support three plastic casters on each caddy, so you may easily reposition each flower. Additional support rods form the base of the items, which can accommodate planters up to 9.5" in diameter. The wire frame withstands daily use, while the green, epoxy finish looks great indoors or out. Perfectly elevate and showcase your favorite potted plants using these Green Plant Caddies. Note: This case pack includes 4 of the Gardman Plant Caddies, Green, 10" dia.